Applying for the Habitat Homeownership Program BEGINS with completing our online Initial Screening Form or the Veterans Initial Screening Form. Individuals who meet the Initial Screening criteria will then be invited to complete a more comprehensive written Homeownership Program Eligibility Application. After fully completing the written application, an appointment must be scheduled to submit the application in person to review with our Habitat Homeowner Services program manager. PLEASE NOTE, Homeownership Program Eligibility Applications will only be accepted in person at our Administration Office, no exceptions. Emailed applications or applications sent by mail will not be accepted. Future homeowners pay Buyer’s closing costs and purchase their homes with an affordable mortgage. Habitat for Humanity of Hillsborough County is currently developing well-built, single-family homes. As an indication of our commitment to quality, durability and sustainability, new homes are certified in compliance with Energy Star and Florida Water Star standards. 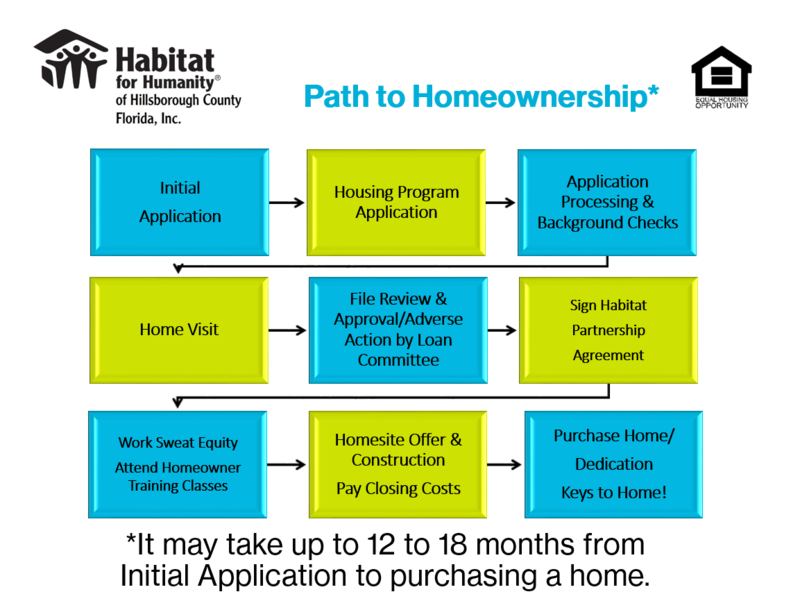 The Habitat Hillsborough Homeownership Program is accepting applications at this time. Please click on the Initial Screening Form button to begin the process. If you are a military veteran, we invite you to click the Veterans Initial Screening Form button.